Childhood Obesity – Can It Be Prevented? 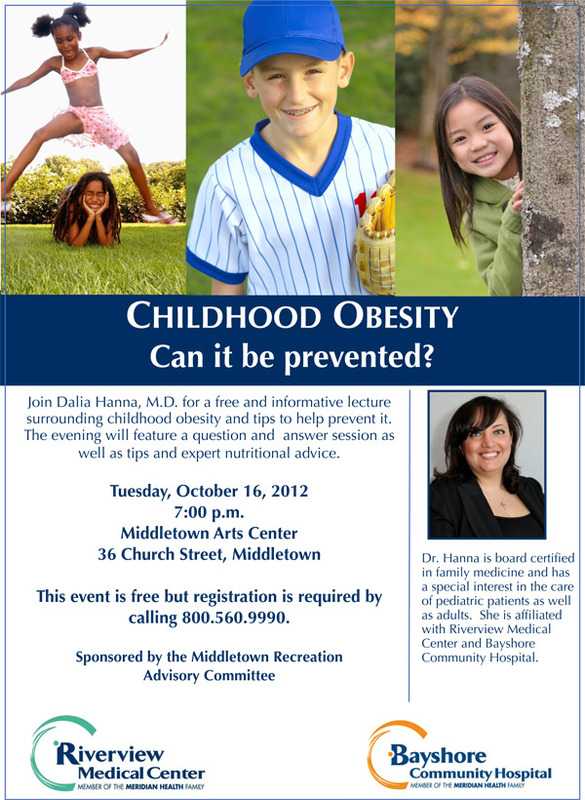 Dr Dalia Hanna will hold a free lecture on childhood obesity at the Middletown Arts Center on October 16, 2012. Join Dalia Hanna, MD for a free and informative lecture surrounding childhood obesity and tips to help prevent it. The evening will feature a question and answer session as well as tips and expert nutritional advice. This event is free, but registration is required by calling 800-560-9990. Dr. Hanna is board certified in family medicine and has a special interest in the care of pediatric patients as well as adults. She is affiliated with Riverview Medical Center and Bayshore Community Hospital.